We’ve all seen it. We pull up to the stop light or are stopped in traffic and look over at the cars next to us and see phone screens. We are all driving home and see drivers holding their phones in one hand and the steering wheel in another. Many of us are guilty of it ourselves. Well, our state legislators have decided enough is enough. House Bill 673 also known as the “Hands-Free Law” was passed by the Georgia General Assembly and signed into law by Governor Nathan Deal. The Hands-Free Law will take effect on July 1, 2018. No other law has impacted drivers more since the seat belt law was enacted in 1988. The purpose is quite simple-to save lives. In 2017, Georgia had over 1,500 fatalities on its roadways. We’ve seen the “Drive Alert Arrive Alive” campaign by the Georgia Department of Transportation. This law takes that initiative to the next level and changes the ways drivers can interact with their phones while driving. Beginning July 1, drivers are banned from holding or resting phones anywhere on their bodies period. No more placing your phone in your laps, on your shoulders or holding them in your hands. Simply put, the phone cannot touch any part of your body. •	Drivers can only touch their phone screens to start a call or end a call. •	Drivers cannot type, read or send text messages, emails, social media content or other internet data while on the road. •	A driver may not send or read any text-based communication unless using voice-based communication that automatically converts the message to a written text or is being used for navigation or GPS. Talk to Text is allowed. •	Drivers can only use their phones to make or receive phone calls by using a speakerphone, earpiece, wireless headphone, connection through their vehicle, or an electronic watch. •	Drivers cannot watch videos while they are on the road unless it is for navigation. •	Drivers cannot use their phones or electronic devices to record video while they are on the road. •	Drivers may listen to streaming music that does not include videos on the screen of their phone or device while driving but cannot touch their phones while on the road to activate or program any music streaming app. Drivers must activate and programs them when they are parked. Drivers cannot touch their phones to do anything to their music apps when they are on the road. Music streaming apps that include video also are not allowed since drivers cannot watch videos while on the road. Drivers can listen to and program music streaming apps that are connected to and controlled through their vehicle’s radio. •	May touch your phones reporting a traffic crash, medical emergency, fire, criminal activity, or hazardous road condition. •	When in a lawfully parked vehicle-this does not include vehicles stopped for traffic signals and stop signs on the public roadway. Headsets and earpiece can only be worn for communication purposes and not for listening to music or other entertainment. 3rd and subsequent, $150, 3 points. Why are cell phones targeted as opposed to other forms of distractions? Studies have shown that phone calls and texts are more mentally distracting than other acts such as eating. Studies have also shown that any kind of phone use increases the chances of death by 4x. Don’t we already have a law? There is a current ban on texting while driving; however, it’s difficult to enforce. This makes is much easier because the standard is whether or not you were holding/supporting a phone. Can I talk to someone via video telephone apps such as Facetime, Skype?No. The law bans drivers from “recordings or broadcasting a video” on any mobile phone, iPad, computer, etc. while operating a vehicle. What do you need to get ready? Consider a phone mount or a wireless headset. 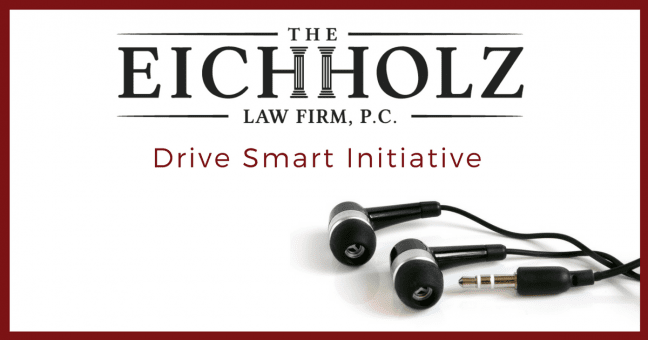 At the Eichholz Law Firm, we see victims of distracted drivers every day. We want to do our part to make the Coastal Empire a safer place for drivers. In consideration of the new law, we have launched our “Drive Smart” initiative, where will be dispensing earbuds with microphones throughout the coastal empire to help drivers get prepared for the new changes. Earbuds are legal and are safer than using a speakerphone.